Ripple In Stillwater: When Is a Lobbyist a Lobbyist? City of Stillwater paying $1,500 a month for "legislative consultant" who isn't a legally registered lobbyist. Does it pass the smell test? Since April, the City of Stillwater has been paying $1,500 a month to what appears by any definition to be a lobbyist to secure state and federal funding and approval for the Bachmann Boondoggle Bridge and other projects. But neither the lobbyist, Mike Campbell, nor anyone else with his firm, the Conach Group, are registered with the Minnesota Campaign Finance and Public Disclosure Board (CFB). In fact, there are no lobbyists representing the City of Stillwater registered with the state at this time. That sounds a lot like lobbying. A penalty of up to $1,000 can be assessed for failure to file lobbyist registration. The City of Stillwater has paid Campbell and his group $6,000 to date. However, according to the novel assessment of Stillwater Mayor Ken Harycki, Campbell isn’t a lobbyist at all, but a “legislative consultant.” There is a “fine line” between lobbying and legislative consulting, Harycki told the Stillwater Gazette. 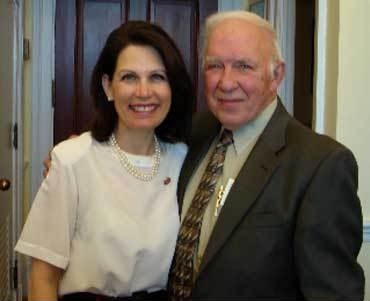 “Campbell is a well-connected person and has helped get two bills passed at the legislature, he is getting results,” Harycki says. That sounds an awful lot like lobbying, too. Campbell is a former director of intergovernmental affairs for the City of St. Paul, a job also once held by Michael Wilhelmi, co-chair and registered lobbyist for the Coalition for St. Croix River Crossing. Campbell was appointed to that position by Mayor Norm Coleman, He was director of governmental relations (lobbyist) for the Davis Family Holdings, and is former executive director of the Senate Republican Caucus. According to Stillwater City Councilor Micky Cook, Campbell “advised” Harycki on his mayoral race and has “advised” other members of the council as well. Harycki has been trying to get Campbell and his group on the city payroll since at least 2007. At Harycki’s request, according to City Council minutes, Campbell pitched the City of Stillwater on a lobbying proposal in February 2007, but the City balked at taking on a new lobbyist at the start of the legislative session. Stillwater had contracted with local lobbyist Ed Cain in 2006 at a rate of $75/hour, to a maximum of $46,000 a year. Cain, who was also a lobbyist for the fraudster known as "Bobby Thompson," had been paid tens of thousands of dollars over the years to lobby on the city’s behalf, mostly for the Stillwater bridge. However, the city appears to have gotten little for Cain’s efforts. Cain last contracted with the City of Stillwater in 2008, according to CFB records. Campbell’s 2007 proposal to the City for “State and Federal legislative services” stated they would “meet with all levels of elected officials their staffs and governmental officials to advocate for the listed and approved legislative agenda,” which included funding for the Stillwater bridge. That also sounds a lot like a lobbyist. In his 2007 proposal for “State and Federal legislative services,” Campbell lists himself, former state representative Tom Osthoff and former General Mills and Gelco executive Jack Bell as principals in the Conach group. However, there are no records of state lobbyist registrations for any of them on file with the CFB as far back as 2005. Campbell’s hiring didn’t come without considerable discussion, raised chiefly by Cook, the City Council’s lone Bachmann Boondoggle critic. Cook also challenged the transparency of the process and the position. She argued that the contract language describing the time devoted to work was vague and ambiguous and suggested that Campbell provide the City with monthly reports on what the group was working on. Cook was concerned that the bulk of the work would be done on the Bachmann Boondoggle at the expense of the armory, Zephyr trail and levee projects, which she supported. In the end, the only change to Campbell’s contract was to adjust the time required to terminate the contract from 90 days to 60 days—a move that Harycki initially resisted. The contract sailed through the Council with Cook casting the only dissenting vote. With no accountability or transparency, it’s difficult to determine exactly what Stillwater is getting for its $1,500 a month in “legislative support.” It’s even more difficult to figure out how one works “to secure the required support of the Federal Government, State of Minnesota and any administrative Department of either entity for the approval and funding of the pending St. Croix River Crossing at Stillwater” without lobbying. Mayor Harycki says there is a “fine line” between lobbying and legislative consulting. It will be interesting to see what the Campaign Finance and Public Disclosure Board makes of Harycki’s balancing act. Something smells rotten in Stillwater, and it ain’t dead sheepshead on the beach. Ripple in Stillwater author Karl Bremer has filed a formal complaint with the Minnesota Campaign Finance and Public Disclosure Board (CFB) over the alleged lobbying of unregistered lobbyist Mike Campbell on behalf of the City of Stillwater. After reviewing the complaint, the CFB will determine whether to proceed with an investigation of the matter. According to the CFB, within 30 days, the board will make a public finding of whether or not there is probable cause to believe a violation has occurred. Also, a check of federal lobbyist records shows no record of lobbyist registration for Mike Campbell or The Conach Group at either the U.S. Senate or U.S. House of Representatives. 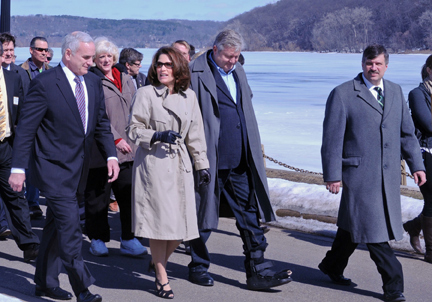 Top photo: Stillwater Mayor Ken Harycki, right, walks lockstep with Gov. Mark Dayton, Michele Bachmann, and husband and political strategist Marcus Bachmann on a tour of the Stillwater Lift Bridge.